We often treat very sensitive and insensitive patients towards stimulation of acupuncture and moxibustion with a Teishin needle. In terms of lacking normal neural process of sensation, there exist the deficiency of Jin-qi, Hie (the fundamental cold) in both cases. Our way of thinking is based on the I-ching, so we consider yin-yang, harmony and moderation to be very important. It is not good thing to deviate in only one side. 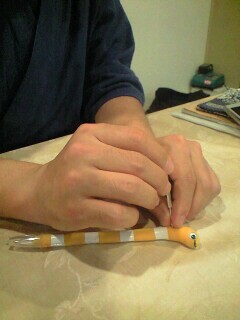 In this way, a Teishin needle can be used in different situations. treatment with a Teishin needle! ?